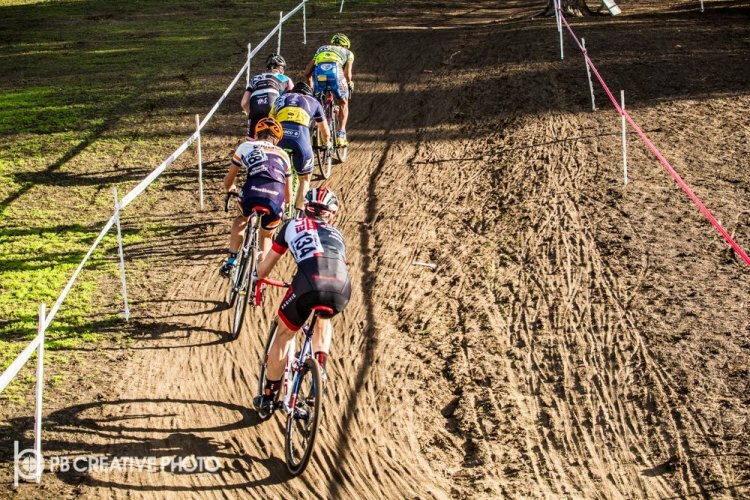 Despite a late-week pummelling from a hand-wringing Pacific storm that spawned drama throughout California (and caused at least one CX event to be postponed), the final round of the SoCalCross Prestige Series went off as planned. Sort of. Santa Cross was intended to be a doubleheader race weekend, but a sunny Saturday was instead spent draining puddles and rerouting sections of the course to avoid the stickiest situations. When participants arrived the next day, many wondered what the fuss was all about. 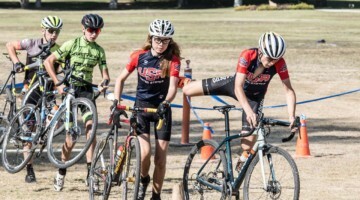 The SoCalCross crew had done a yeoman’s job of cleaning things up and keeping it real. Very little mud was to be found, in fact, and after the first couple of races the surface was more akin to Velcro®. That’s not to say the course was easy by any means. The familiar Pierce College venue on the west end of the San Fernando Valley is basically a large bowl. The start/finish area, expo and team tents are located at the bottom, and the course is pointed up and down the sides and around the rim. 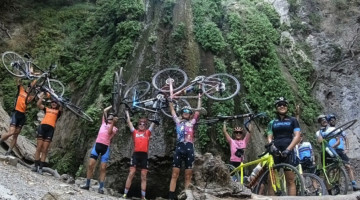 This makes for several challenging climbs and tricky switchback descents, as well as some of the highest top speeds experienced all season. 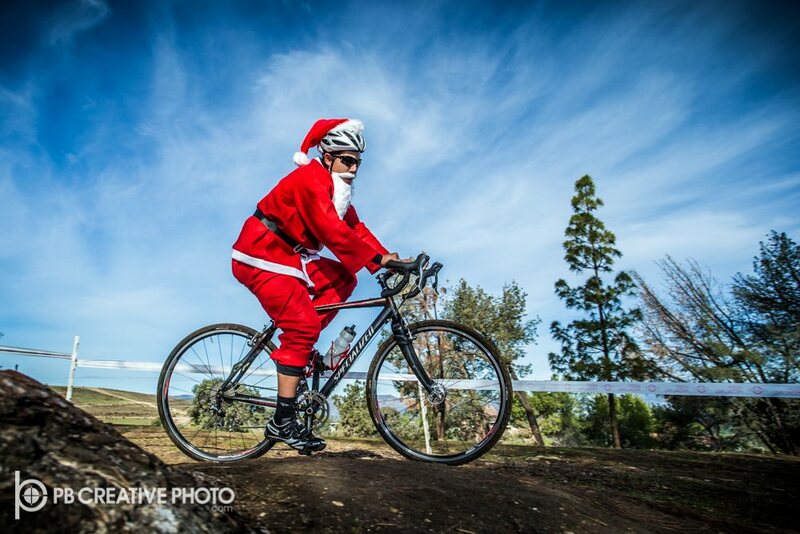 It was a yuletime holiday scene with an enormous pile of “presents” being doled out to podium finishers in all classes. But what many had come for was not gifts but glory. 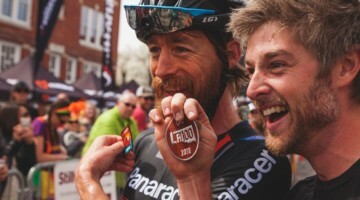 This final event, Round 14, was offering 1.5x the usual points — a rider’s best eight finishes throughout the season are counted — so any athlete with an eye on the standings needed to throw down. Brent Prenzlow did just that in the Elite Men’s class, with authority. This 46-year-old from Carlsbad knows how to win a cyclocross race. 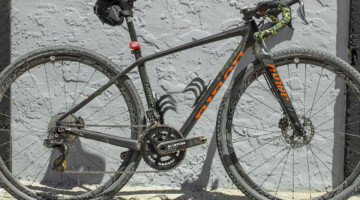 Coming into Santa Cross, the Celo Pacific/Focus-backed rider had won 119 SoCalCross events (as well as five overall championships, eight district championships and a UCI event). In short, he’s the godfather of ‘cross in SoCal. Prenzlow hung out at the back of a five-man group that had escaped the field on just the second lap. 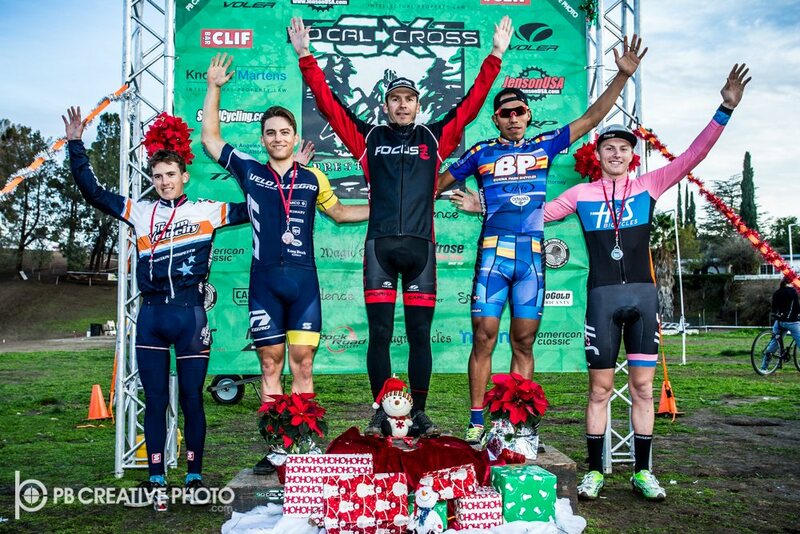 Included were youngsters Rex Roberts (Velo Allegro), Spencer Rathkamp (H&S Bikes), Michael Barker (Team Velocity) and, in the Voler Series Leader jersey, Alfred Pacheco (Buena Park Bikes). These five circulated the course half a dozen times in nose-to-tail formation. 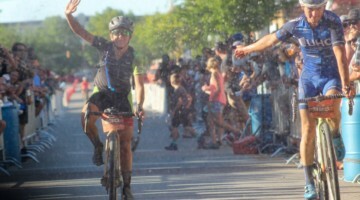 The Elite Women’s event was a runaway as well, and again, it was performed by one of the series veterans. Christina Probert-Turner (Turner Bikes.com/The TEAM), 47 years young, rode away from 15-year-old Summer Moak (Felt/K-Edge) at the halfway mark and remained unchallenged the rest of the way. 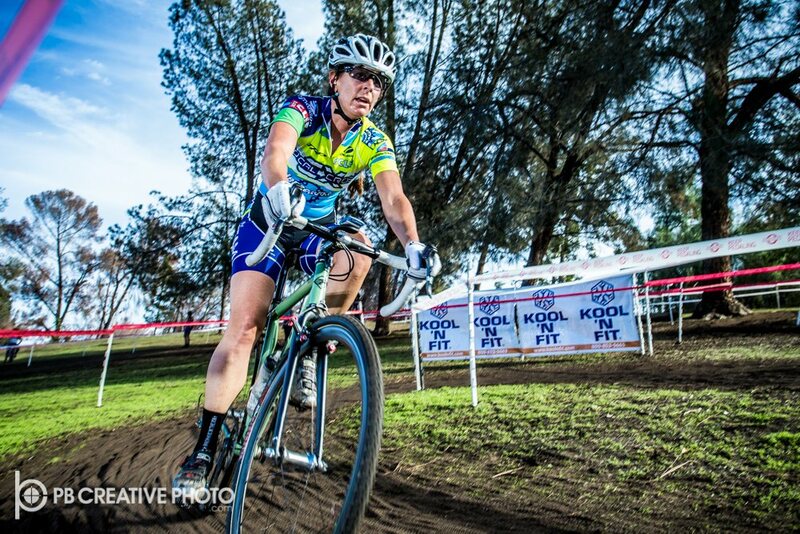 Christine Pai (Knobbe Martens Intellectual Property Law) was able to reel in Moak on the last lap for second place. Robin Kaminsky (StageOne) took a hard fall on the switchback descent on lap two, but was able to shake it off and finish fourth. 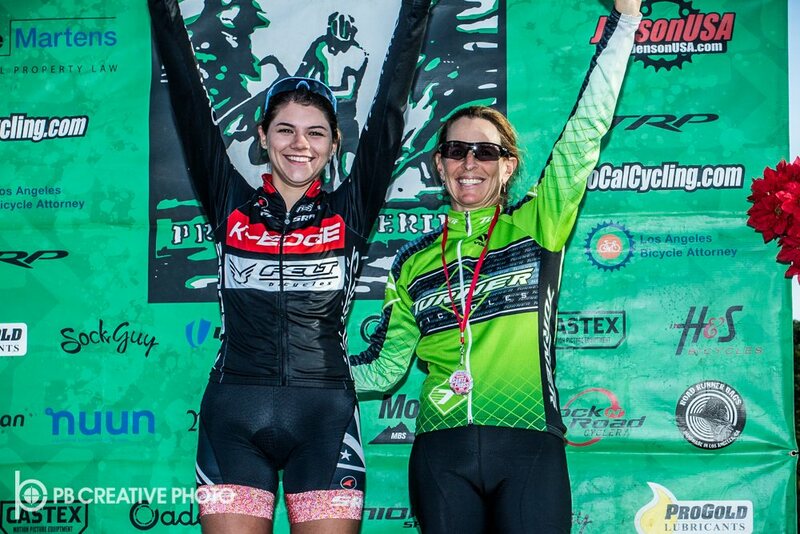 Like Pacheco, Moak leveraged consistent podium finishes (but no wins), to easily claim the Women’s crown. Both Moak and Probert-Turner (series runner-up) pointed out that not having contenders Amanda Nauman and Nicole Brandt in regular attendance had an affect on the results throughout the year. 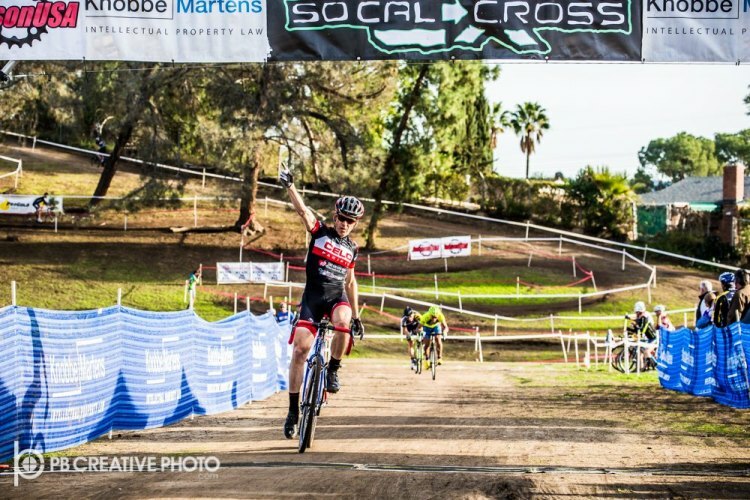 Full results from Santa Cross and the series will be available at SoCalCross.org.